Why Choose Nurture Kids Dentistry? Nurturing your child to a healthy and happy smile. Dr. Jumani specializes in caring for the dental needs of children, adolescents, teenagers, and special needs patients. We give them the ideal treatment they deserve! Your child’s health and welfare is very precious and needs to be delicately cared for. The same is true of their teeth and gums! 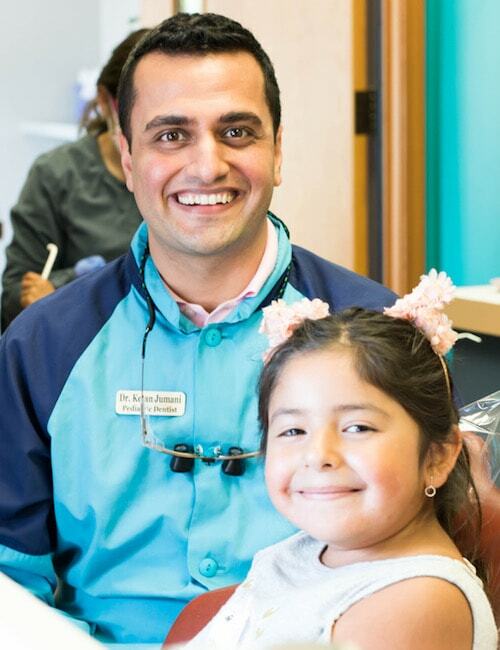 Dr. Ketan Jumani has pursued two additional years of dental education to qualify as a board-certified pediatric dentist. As a children’s dentist, he is able to provide the ideal care for infants, adolescents, teenagers, and patients with special needs. You can feel confident that every time your child enters our office, he or she is in safe, caring hands. We are great with kids and even better with smiles. Each child enjoys the focused attention of Dr. Jumani during his or her visit. He adapts his care to meet your child’s needs and always ensures they have fun. We believe the appointment should be all about them! Our Sammamish office is purpose-built to provide the highest level of pediatric dental care. Meeting kids at their stage of life allows us to develop long-lasting relationships and show them that dentistry can be fun and beneficial. We genuinely treat them as we would our own families. Your child’s comfort and wellbeing is of utmost importance to us. Therefore, we have created a relaxing, informal environment where kids can flourish. We have a play area, super fun team, and explain everything to help patients feel calm. We understand that parents may feel anxious when children first visit the dentist. Our team is here for you too! We’ll explain every procedure and ensure you and your child feel comfortable before starting any treatment. We’re on your side and always happy to help. I have worked in dentistry for the last 30 years. It has been my pleasure to work alongside Dr. Jumani for the last two. His mastery of dentistry can only be matched by his warmth and compassion. Children love him as do their parents. He is a rare gem! Specially designed to help children and parents feel comfortable and relaxed. We are committed to providing your child with the ideal options to suit their individual needs. Dr. Jumani enjoys going the extra mile for his patients and hopes his office reflects this approach. Meet the people behind the smiles?